For those following Prism 6.3, it's been a while coming, but there is a lot there. Here are a few helpful things to get you going. One of my favorite additions to Prism Forms 6.3.0 is the addition of Behaviors. First of all Prism gives you a great BehaviorBase<T> class you can use for all of your custom behaviors. But we finally have an EventToCommandBehavior that allows us to execute our ViewModel Commands when an event is triggered, and the control doesn't directly support Commands for that event. This is great for things like attaching to something like a ListView where we might want to work with the ItemTapped or ItemSelected events. You have a wide degree of flexibility here where you can choose to directly accept the EventArgs in your command or you can use a custom converter to grab the item from the EventArgs. One of the breaking API changes you may notice is with the NavigationParameters. In the past, the NavigationParameters was based on a Dictionary which gave us the limitation that a key could only be used once in the querystring. While most of the time this was fine, there are so many cases where you just need to pass a list of something. Along with the new implementation are some great helpers including both a GetValue<T> and GetValues<T>. These are also safe to use if the key didn't actually exist so there's no more need for if( parameters.ContainsKey("foobar")) FooBar = (Foo)parameters["foobar"]. Naturally you will get a default value, so do check for `null`. Probably one of the most used interfaces in my Prism Forms apps, is INavigationAware. This is a major breaking change. That said, it's worth the frustration of the breaking change here. First of all INavigationAware is no longer a standalone interface. It is now actually the combination of two concepts INavigatingAware and INavigatedAware. As the verbs imply, one is based on Navigation that is about to occur, while the other is about Navigation that has occurred. One of the complaints I often heard, and frankly had myself was that with OnNavigatedTo, there was a visible UI update as my ViewModel was updating the Values that were bound on the UI. INavigatingAware with it's singular OnNavigatingTo really helps to address this problem. The reason why we were seeing the UI changes was that the ViewModel never had a chance to load before we pushed the page onto the Navigation Stack. OnNavigatingTo is only called once, and only before we actually push the page to the stack. Like the sample below shows, we may have some default value that is really only there to alert the developer of a problem or is there for the design time. With the OnNavigatingTo, this value will no longer appear when the the page is actually pushed as the value of Message will update to whatever was in the NavigationParameters. private string _message = "some default value"
// You only need to do this on the child if any of your child pages actually implement this. With this strategy you can now both initialize your Tabbed Page Children, and handle the Activation/Deactivation events that occur when the user changes the tab. You can check out a complete example of this in the Prism Samples. IoT has been exploding over the past few years, and nowhere is more evident than with the community surrounding the Raspberry Pi. It is probably one of the most versatile ARM platforms being used today. With all of this support we have a wide degree of options. Enter Docker... with the benefit of preconfigured images from Hypriot, you can now easily set up a fully functional Docker Swarm in mere minutes. 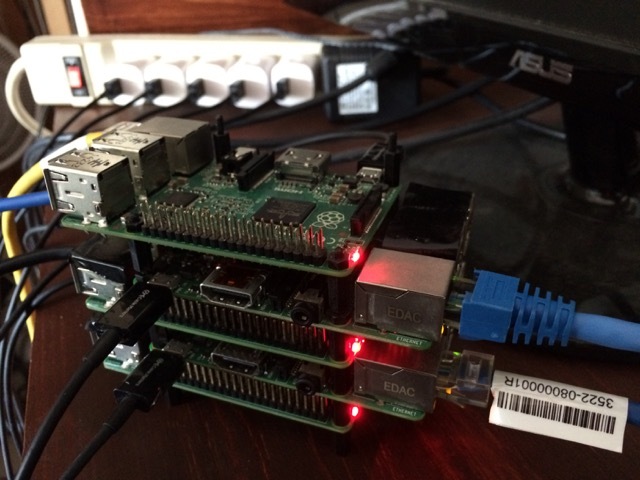 For those who know about Docker, let me start by saying I don't believe you'll learn anything new from this post other than perhaps you can make it work on Raspberry Pi. As for functionality with Docker Swarm running I was able to quickly deploy a number of services including MariaDB, PostGRE, Gogs, along with a number of other applications. It really shouldn't come as a huge surprise that you can have highly available services which are easily deployed using Docker, for me what was the most telling factor was the hardware involved. One of the first things you may notice about the hardware is I had no real cost for my cables or switch. That's because I pulled out a few old cables and a switch I knew I should throw out but for some reason kept. Now I should probably say I would probably not recommend this for a larger business, but when you have an fully functional cluster of actual physical hardware that can provide Enterprise like availability, drawing very little power... I would say this is an excellent feature for small businesses which may be a little shy about having some hosting service host their data in the "Cloud". We all might try to pretend that the code we wrote is perfect and will never break, but if there is one constant in Software Development it is that no matter how genius you were when you wrote your code, you are bound to run into bugs. As every developer is all too aware, debugging can present a real challenge, particularly when the code must be executed from within a specialized environment remote from the developers own computer. As .NET developers we have transitioned our model to a Cloud First mentality which is to say that all of our processes must work in the cloud including the ability to debug our code. When I found myself suddenly needing to reach out to the Cloud as any developer would I began researching what options were available. 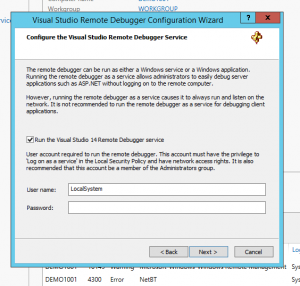 It didn’t take long for me to find out that Visual Studio offers free Remote Tools. Unfortunately every article I read seemed to be either out of date or leave just enough information out that it ultimately led me in circles. From vNow to vNext, .NET provides one of the friendliest environments for working Cloud First once you understand the tools at your disposal. Regardless of what type of .NET application you have deployed on your Windows Cloud Server, Visual Studio provides you with an easy out of box solution for securely connecting to your live code in the Cloud. While every development situation is a little different, one of the common one’s that I see today is for the Web App Developer. 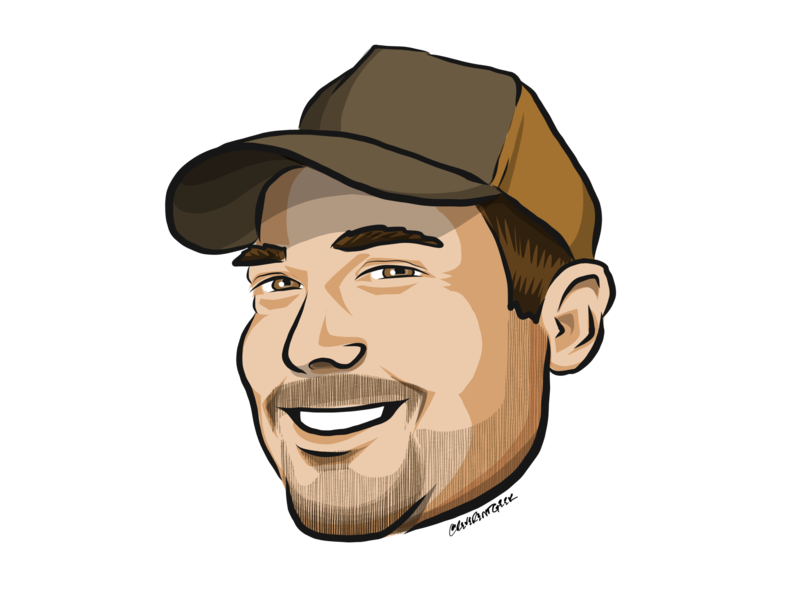 With that in mind here’s a simple guide to go from a fresh Cloud Server to a Web Server that you as a developer can fully utilize to debug your code. Perhaps this should go without saying, but Install the Web Server (IIS) Role. This can be done manually or by using either Web Platform Installer or the included script. Install Web Deploy 3.5 if you want to deploy your solution directly from within Visual Studio. This should be done from within Web Platform Installer or the included script. You should also verify that all of the Features of the Web Server you want are installed. 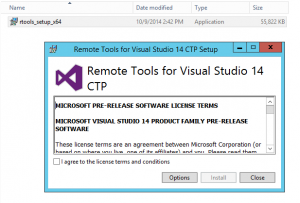 Download and Install the Remote Tools for the version of Visual Studio you have installed and will be using. The installation process is extremely simple, simply agree to the license and click Install. The installer has the same easy flow for vNow to vNext. Agree to the Terms and Conditions and click Install. 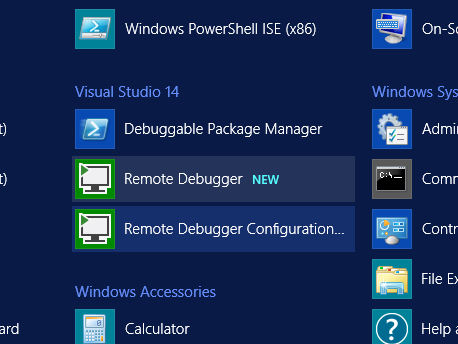 Following the installation you will need to open the Remote Debugger Configuration Wizard from the Start menu. Since it just seems like a bad practice to leave your server open to anyone to be able to connect to the processes, my suggestion would be to opt for running the Remote Tools as a service. You can use any account you want though running it as the Local System should be fine for most applications. 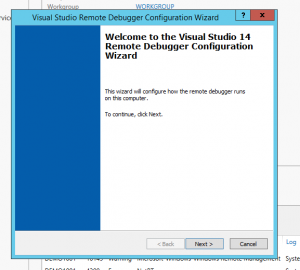 Debugger Configuration Wizard. You want the Wizard to set it up as a service. Once you’ve configured the Remote Tools to run as a Service; your server is ready for Cloud Development. If you open your Visual Studio Project simply right click the Project and select Publish.